RO (Reverse Osmosis) rental units that are skid mounted and ready to use, to improve the quality and efficiency of industrial water treatment processes. The RO equipment can be configured to allow operation as a single pass or double pass system and allow flexibility in adjusting flow rates based on production needs and influent water quality. 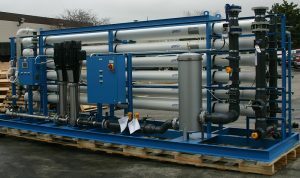 We will custom design Reverse Osmosis solutions for each customers’ unique requirements. We Supply all manufacturers’ RO membrane elements. We provide services to change out membranes, clean or replace them. The Reverse Osmosis system operates using a pressure driven, membrane process and uses a broad range of water treatment applications. Reverse osmosis works by applying pressure to aqueous streams in a reverse osmosis membrane. The applied pressure causes water to flow to one side of the membrane and prevents the removed solids from penetrating. The supply water is split into concentrate and permeate streams. Sepratech’s customer base consists of power utility groups, petrochemical organizations, refineries, pulp and paper industry, municipal drinking water and wastewater. Our Lamella Clarifier, Clarifier Rentals, RO services, Mobile Clarifiers as well as all of our products, provide solutions to assist our customers in cleaning, protecting, recycling and reusing water. Our Focus – Our Customers! has been serving the Water and Wastewater Treatment Industries Nationwide Since 1989.